There are 16,000 fewer children in institutions today compared to 2013. 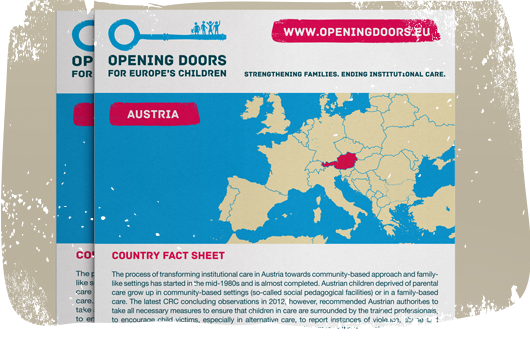 This is based on the latest compilation of data from 11 European countries that are the focus of Opening Doors for Europe’s Children campaign which is led by Eurochild and Hope and Homes for Children. However, poverty remains a major culprit for the institutionalisation of children. These latest country snapshots on de-institutionalisation cover Bulgaria, Estonia, Greece, Hungary, Latvia, Lithuania, Romania, Bosnia and Herzegovina, Serbia, Moldova and Ukraine. “The latest figures are encouraging for our work with national governments and the EU; however much more remains to be done”, says Jana Hainsworth, Secretary General, Eurochild. More than 1,000,000 children are believed to be stuck in institutions in Europe, more than half of which are in the European Union, isolated from the care and support of families and communities. The EU’s support for de-institutionalisation in combination with efforts of national NGOs have brought improvements in the past two years. The regulations on the use of European Structural and Investment Funds and European Neighbourhood and enlargement policies encouraging a transition to family and community based care are helping governments to move closer to de-institutionalisation. The Pre-Accession Instrument (IPA) has brought important contributions to countries like Bosnia and Herzegovina. However, a considerable amount of children are still entering public care and rates of family separation are high in a number of countries, including Bulgaria, Lithuania, Serbia and Ukraine. In Greece and Hungary, child poverty is on the rise, with investment in social services being lagging behind and NGOs reporting increasing rates of institutionalisation. “Considering the clear relationship between child poverty, lack of family support and services, and family separation & institutionalisation rates, we urgently call on the EU institutions and Member States to fully implement the EU Recommendation on Investing in Children which supports investment in prevention, support and services at local level, including for children with disabilities”, concluded Ms. Hainsworth. The country snapshots also show that Roma children and children with disabilities are disproportionately represented in institutions. Despite bans on institutionalisation of children under three in several countries, young children are still found in institutions in many countries. The 11 country snapshots on de-institutionalisation were compiled by: National Network for Children in Bulgaria, Igale Lapsele Pere in Estonia, Roots Research Center in Greece, Family Child Youth Association in Hungary, SOS Children’s Villages in Latvia, Save the Children Lithuania & SOS Children’s Villages Lithuania, Hope and Homes for Children (HHC) Romania, HHC Bosnia and Herzegovina, MODS in Serbia, HHC Moldova and HHC Ukraine. Country snaphsots are available here. The European Commission Recommendation of 2013 Investing in Children: Breaking the cycle of disadvantage explicitly calls on Member States to use the Structural Funds to stop the expansion of institutional care in Europe and promote quality family-based care. The new EU Cohesion Policy for 2014-2020 explicitly mentions de-institutionalisation as a priority in the use of the European Structural Fund and the European Regional Development Fund.